The red telephone box was designed by Sir Giles Gilbert Scott (1880- 1960) and, along with the red post box and the red London bus, is an instantly recognizable symbols of Britain. Scott's design of the K2 cast iron telephone kiosk won a Post Office sponsored competition in 1924. His updated K6 design follwed in 1935. A leading architect, Scott is famous not only for his telephone boxes. His achievements include producing the winning design for Liverpool Cathedral and overseeing the rebuilding work required at the Houses of Parliament after the Second World War. The red K2 telephone box was introduced to the streets of London in 1926. It was used solely in the capital and only a few were erected elsewhere under special circumstances. The K2 is both impressive and imposing, weighing over an imperial tonne. On top of the kiosk, on all four sides is the Royal crest of King George V formed from a series of holes to provide ventilation. K2 telephone kiosks are older and larger than the more widely used K6 telephone box and are very rare. Only about 1500 K2 kiosks were produced and only a few remain today. 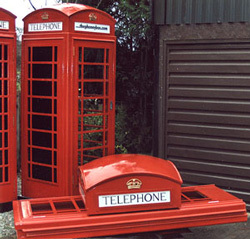 The K2 telephone box was too big and expensive to be used nationally. The Post Office, once responsible for public telephone boxes in Britain, discontinued production of the K2 kiosk in favour of other designs. In 1935, the Post Office commissioned a new kiosk from Scott to celebrate the Jubilee of King George V. The K6 Jubilee Kiosk, as it is known, was similar to the K2, being made of cast iron and painted red but was 25% lighter in weight at around three quarters of a ton. By the end of the 1930s there were 20,000 K6 telephone boxes in use all over the UK. In the 1970s and 80s, as public telephone boxes began to age, sadly problems with vandalism and a failure to repair damage quickly resulted in the demise of the classic red telephone box. In 1985 a newly privatised BT announced sweeping changes to improve the condition of kiosks. There was a lot of experimentation with new designs to prevent vandalism, which resulted in many K6 telephone boxes being removed from our streets and sold off. The replacement boxes were less pleasing to the eye and had little design merit. Fortunately, however, about 2000 red telephone boxes were declared listed buildings and remain in place.